A children’s book about magic, in fact, unapologetically about magic. Bemoaning that magic has already disappeared. Sounds like other books, but… this one is set in Brooklyn (Yeah! my home town), and has people of color at the only characters. After reading the author’s notes at the end, I realize this children’s book is long overdue. As she notes, “The trouble with magic, as it is represented in much of children’s literature, is that it appears to exist in realms to which only certain children belong.” How true, I realized, and how sad that we’ve accepted segregation even in our children’s literature, unconsciously. 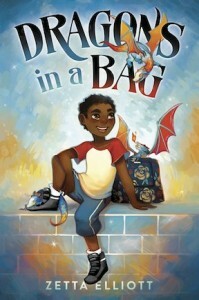 Aside from breaking through those social barriers of race and magic, this children’s book stands on its own as a wonderful romp into dragons, time travel, and witches. It leaves us also with an open ending, so that anything can happen. Most of all, as the young boy of the story says, it offers us a bridge between the worlds of urban reality and fantasy. Highly recommended for all children, from age 8 to 12. I’m hoping there will be a few more like this as a series.